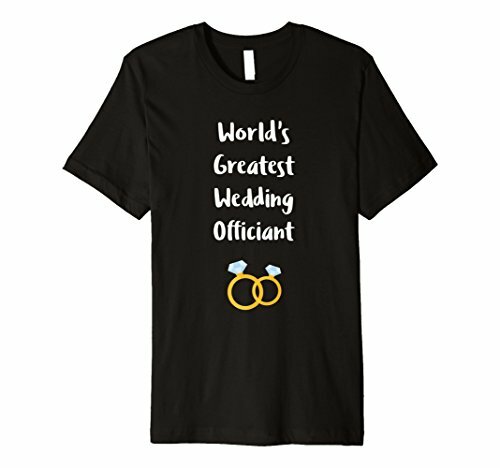 Worlds Greatest Wedding Officiant Shirt, Get this fun "World's Greatest Wedding Officiant" graphic novelty apparel tee, perfect bridal wedding party shirt for bride and groom's ordained wedding minister or officiant, thank you gift too, make friends smile. Wedding Minister Shirts, for Men or Women, If your friend or family member got their certification online this funny thank you gift makes a fun keepsake for your ceremony by the Official Minister, great to wear at the rehearsal dinner for laughs. Check out "Wedding Minister Party Apparel Gift Shop" for more designs. If you have any questions about this product by Wedding Minister Party Apparel Gift Shop, contact us by completing and submitting the form below. If you are looking for a specif part number, please include it with your message.